This Case is sponsored by Milestone Medical, the technological leader in Microwave Accelerated Tissue Processing. 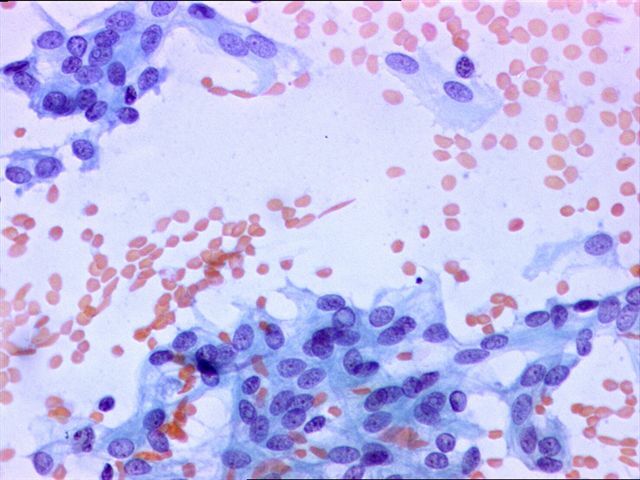 Milestone manufactures instrumentation and accessories that enable Histologists and Pathologists to achieve the highest level of productivity, while maintaining their flexibility and safety. Milestone�s family of rapid microwave lab stations allow tissue samples to be processed in a fraction of the time as compared to conventional methods, allowing for same-day diagnosis. Milestone also offers a line of digital imaging equipment for grossing stations and autopsy rooms. 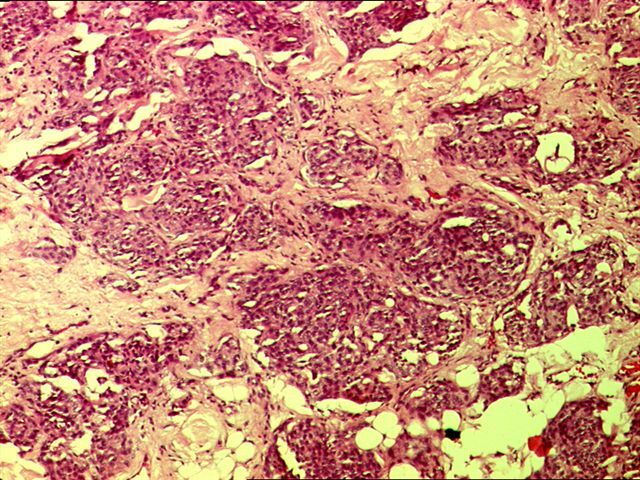 These systems serve as a comprehensive method of storing macroscopic images of all specimens examined in the laboratory, providing an invaluable diagnostic database for routine grossing, teaching, and research. For more information, please visit Milestone�s website by clicking here. We thank Dr. R. F. Chinoy, Tata Memorial Hospital, Parel, Mumbai (India) for contributing this case. 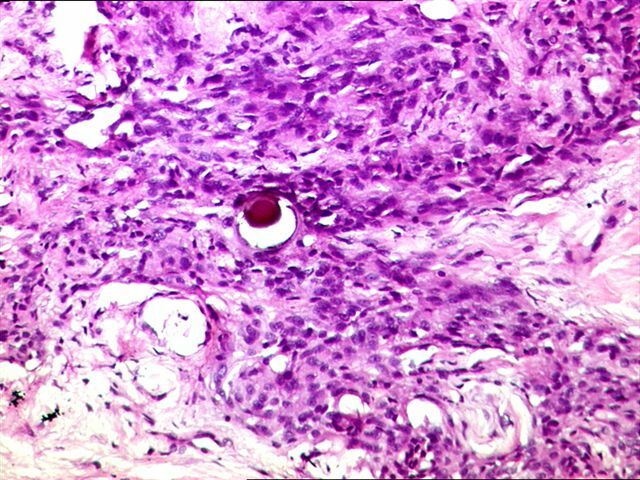 To contribute a Case of the Week, please email info@PathologyOutlines.com with the clinical history, your diagnosis and microscopic images in JPG, GIF or TIFF format (send as attachments, we will shrink if necessary).� Please include any other images (gross, immunostains, etc.) 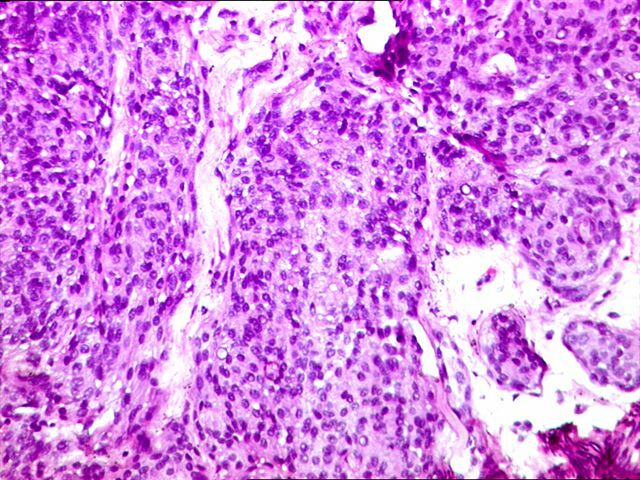 that may be helpful or interesting.� We will write the discussion (unless you want to), list you as the contributor, and send you a check for $35 (US dollars) for your time after we send out the case.� Please only send cases with a definitive diagnosis, and preferably cases that are out of the ordinary. 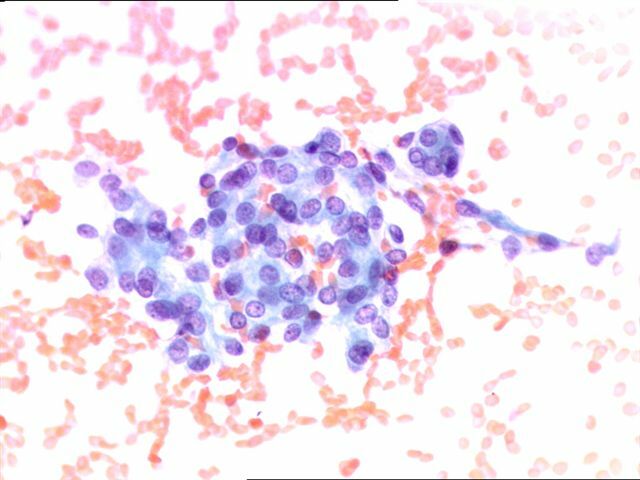 FNA of a neck nodule from a 22 year old man.� The requisition form indicated that this was a thyroid mass. 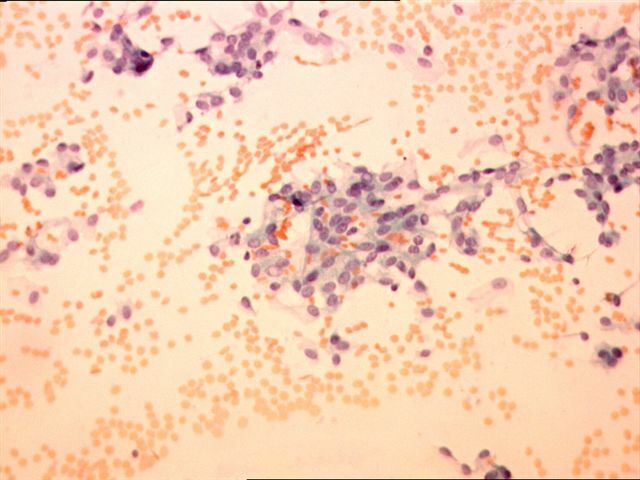 The fine needle aspirate shows sheets of bland, round to oval cells with a suggestion of whorling.� The cells have abundant cytoplasm, indistinct cell borders and nuclei with finely granular chromatin and small nucleoli.� Intranuclear inclusions are common, and occasional nuclear grooves are seen.� These features are suggestive of meningioma (Diagn Cytopathol 1999;21:402), although the location is not typical.� Subsequently, it was learned that the actual tumor location was the base of the skull.� Nuclear grooves are also uncommon in meningioma, although they have been described (Acta Cytol 1991;35:501). 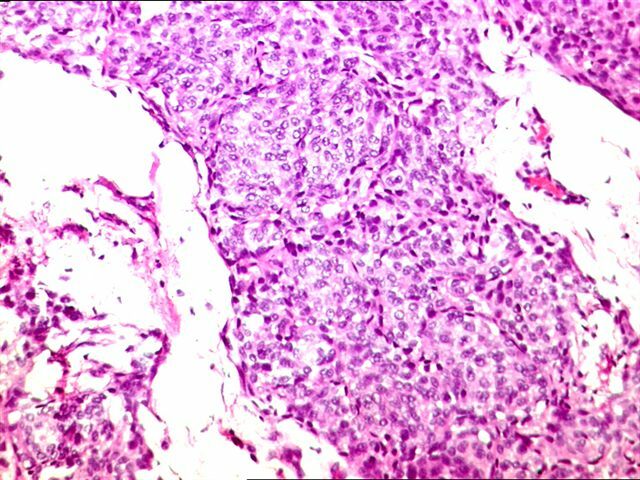 The frozen section and permanent sections show features more typical of meningioma, including meningothelial cells in syncytial sheets and whorls with psammoma bodies. 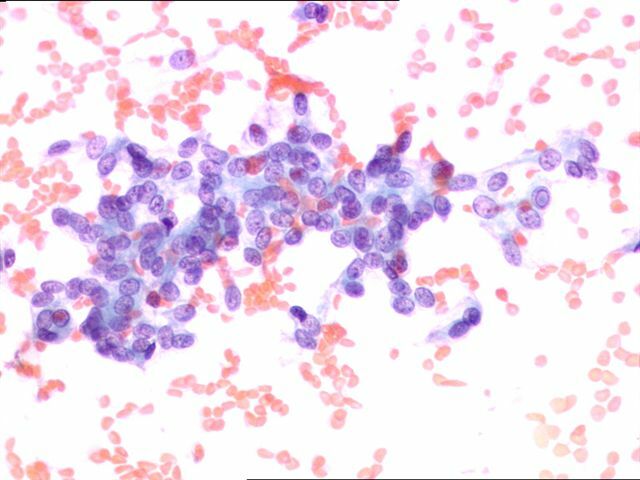 The most important differential diagnosis of the fine needle aspirate is papillary thyroid carcinoma, in part because the requisition indicated (incorrectly) that this was a thyroid mass.� In addition, both tumors have nuclear pseudoinclusions, nuclear grooves and psammoma bodies.� Diagnosis may require frozen section or radiologic correlation to determine the precise location of the mass (Acta Cytol 2001;45:1053).� Immunostaining for EMA (positive in meningiomas) or keratin (weak/negative in meningioma) may be helpful.